Peirce has always had a long-standing commitment to members of the Armed Forces who choose to continue their education. From our founding when we first opened our doors to provide returning Civil War vets with the preparation needed to return to the workforce, through both World Wars and up until the present, the support of veterans has always been deeply engrained in our culture. 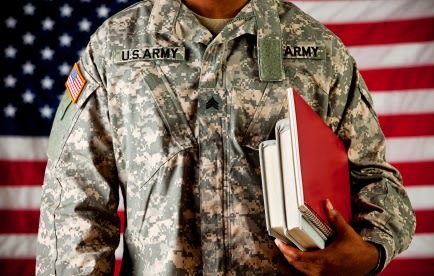 earn college credit based on their knowledge and experience obtained both during and after their service. In addition to DANTES, we provide a range of benefits for military students that can help ease the financial burden of returning to school. These benefits include the Protect and Serve grant, a special tuition-based scholarship designed specifically to fit the busy, mobile lifestyle of military members and their families. The grant can reduce tuition by up to 25% and spouses and dependents are also qualified. Peirce College is also a long-standing member of Servicemembers Opportunity Colleges (SOC), and we have a full Military Support Team dedicated to answering any questions you may have. The Peirce learning environment is ideal for military students who come with so many skills acquired through their service. Qualities like attention to detail, ability to function in stressful situations, and teamwork are all developed while in service, and they contribute to the success that Peirce military student while pursuing their degree. Learn more about the DANTES exam, administered by The Chauncey Group International, a division of the ETS. Your credit eligibility for courses based on other standardized tests will be evaluated on a case-by-case basis based on the American Council on Education’s (ACE) standards. You can also learn more about Peirce’s support for military students by visiting our Military Student FAQs page.